This Child Hunger End Here post has been brought to you by TheMotherhood. All opinions are 100% my own and may differ from yours. I will only endorse companies, products and services that I believe, based on my own experiences, are worthy of endorsement. The thought of a child going to bed hungry breaks my heart. I know what it’s like to be sick and can’t eat, or have to go 24 hours without solid food for medical tests… the hunger pains are excruciating. I cannot imagine having that feeling on a daily or somewhat daily basis. I also do not see any excuse for a child in the United States to ever go hungry. C’mon, we are the land of plenty. Right? At least in many cases throughout the U.S. many children to do not know where their next meal is coming from. Sad, but true. More than one in five children, including more than one in four Latino children, in the U.S. may not know where their next meal is coming from. That’s nearly 16 million children, a number that could fill 8,000 playgrounds. Children who experience even intermittent struggles with hunger may suffer serious, long-term consequences to their health, well-being and educational achievement. What’s more, being hungry robs kids of the promise of childhood – the ability to play, grow and learn. At ConAgra Foods, we find this unacceptable. That’s why we are partnering with P&G to build a community of people to make a difference and help donate up to 7 million meals through the Child Hunger Ends Here campaign. It’s easy to make a difference: Look for the red pushpin on participating product packaging for a code found on these specially marked ConAgra Foods and P&G products. For each 8-digit code entered at www.ChildHungerEndsHere.com from March-August 2014, ConAgra Foods or P&G, respectively, will donate the monetary equivalent of one meal to Feeding America. Child Hunger Ends Here is proud to work with Hunter Hayes and be the presenting sponsor of his “We’re Not Invisible” tour. For every download of Hunter’s new single, “Invisible,” on iTunes, Child Hunger Ends Here will donate the monetary equivalent of one meal to the nation’s leading hunger-relief charity, Feeding America, up to 1 million meals. One of the easiest ways to learn how to get involved is to join the Child Hunger Ends Here Facebook community at Facebook.com/ChildHungerEndsHere or follow the news on Twitter and Instagram at @ChildHungerEnds. It truly is so easy to help. On my right sidebar is a place to enter the 8-digit code on specially marked ConAgra Foods. Now Kroger is offering deals on specially marked ConAgra food products. It really is a win-win. You can save money and help Child Hunger Ends Here at the same time. I’m taking advantage of these offers. Especially the Ro-Tel, Hunt’s Tomato Sauce, and Manwich. I make Manwich often for my family. It’s always a hit. As you can see from the above photo. Please join me in looking for the red push pin on specially marked ConAgra products and then entering the 8-digit code in the widget on my right sidebar and help end child hunger. You can buy products you use and love while making a difference. That’s a win-win! I love when brands support causes like this. Hunger is rampant right here in the US yet we waste so much food. It is great that they are making a difference! Looks like a good time to stock up on some of my favorite Hunt’s products! I did not know about this, so thanks for heads up!!! I shop at our local Dillons (kroger affiliate) alot, so I will have to look out for the speciality marked items! Our local 4H is constantly doing food drives to stock our food pantry for the families in need. Too bad we don’t have Kroger or we’d be shopping there during these dates. I love companies that give back! What a great project. This is a great cause, however I don’t think we have Kroger in the north east. Would love to participate, will research it though. I looked up my area and I was so sad to see how many children are hungry here! A great cause! We love Manwich here, too. I wish we had a Kroger closer by, though. So happy ConAgra has a heart and is helping to tackle this issue. I have a Kroger near me so I’ll look for the pushpin. This seems like such a fabulous program! There are no Kroger grocery stores near us but have been hoping they would open some up. A very nice gesture on their part. This is a great cause! I need to remember to sit down and enter the codes more often. We don’t have Krogers here in MN, but I think it’s wonderful what they’re doing. The statistics are so sad with Child Hunger. I wish we had a Kroger near us. That’s a wonderful program to be apart of. There were times when I was a kid that I didn’t have food in my home, so this is an important cause to me for sure. I’ll be looking for codes! I love that Kroger is helping out such a great cause! 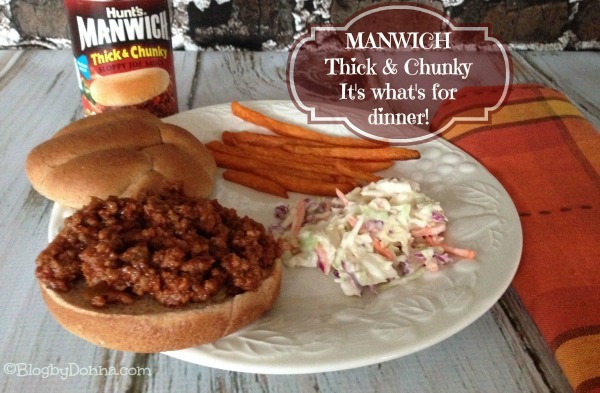 We’re huge lovers of Manwich, too! You should try making it and putting it over pasta – so good! Thanks for sharing this. It’s definitely sad that there can be so much hunger in an area with so many affluent bits. This is fantastic! What a great way to help others. We’re going to go shop at Kroger this week, so I’m going to be on the lookout for these products so we can be a part of this great endeavor. It’s sad that hunger is so prevalent in the US. I love when companies support a cause like this one.